Infiniti began in 1989 as the luxury car imprint of Renault and Nissan, adding the first Infinity SUV in 1997. Since then, Infiniti has produced three different SUV lines, with several different specific models underneath the various imprints. Those shopping for a luxury sport utility vehicle should examine their options in the Infiniti line. These vehicles consistently receive high marks from consumer automotive guides, putting them on the radar of anyone who isn't afraid to spend a little extra for quality. Since the first Infiniti SUV rolled off the lines in 1997, there have been three SUVs in the Infiniti family. Infinity QX: The Infiniti QX was the first SUV ever produced by the company. It is one of the best SUVs on the market, with various publications naming as the best full-sized luxury SUV. The vehicle received particularly high marks for performance, making this a favorite of the luxury SUV customer who wants a little extra something under the hood. The first QX, the QX4, was little more than a Nissan Pathfinder with some luxury options and Infiniti badge on the grill. Infiniti discontinued the QX4 in 2003, making room for the QX56. 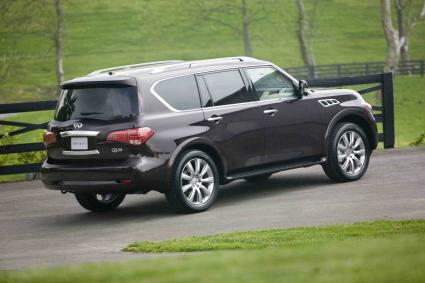 The new QX56 had features of both a Nissan Armada and Titan put together with luxury features on the inside. The vehicle received an extensive facelift for the 2010 model year, removing the Armada elements from the design. Infiniti FX: The FX was the second SUV introduced by Infiniti and is a crossover-type SUV. This means that it is smaller and shares some features with other types of vehicles. In the case of the FX, the designers sought to combine qualities of a sport utility vehicle and a sports car. The first generation of Infiniti FX vehicles ran from 2003 until 2008, with a cosmetic facelift for the 2006 model. The two models, the FX35 and the FX45, have two different engines, with the FX35 coming with a 3.5-liter engine standard and the FX45 coming with a 4.5-liter engine. The FX35 was by far the more popular vehicle, outselling the FX45 by a factor of ten to one. The second generation, introduced for the 2009 model year also included an FX37 and an FX50, again based on the size of the vehicle's engine. The FX37 has only ever been available for purchase in Europe. Infiniti EX: The Infiniti EX was the third SUV introduced, another crossover SUV. This is a more compact vehicle than the FX, based on the same platform as Infiniti's FX, G and M models. The car is available in four models: the EX25, the EX35, the EX37 and the EX30d. Again, the numbers in these car names refer to the displacement of the engine. The "d' in 30d refers to the fact that the car runs off of diesel, as opposed to traditional gasoline. The car is particularly sporty, boasting a top speed of 144 miles per hour. You can get an Infiniti EX in either a five- or seven-speed automatic transmission. The car also provides a mode where the driver can manually shift between different gears for those who prefer more control over their driving experience. Infiniti only makes three SUVs, and two of them are crossovers. This means that the person shopping for an Infiniti SUV doesn't have very many options. The QX is for someone who wants a lot of room and towing power, while the FX and EX lines are essentially for people who want a sports car with a greater towing capacity and cargo space. Once you have decided which of these options is most attractive to you, you have essentially already decided which Infiniti SUV is the right vehicle for you.